Ready-mix concrete can make a mess, and it is extremely challenging to remove it from concrete trucks. 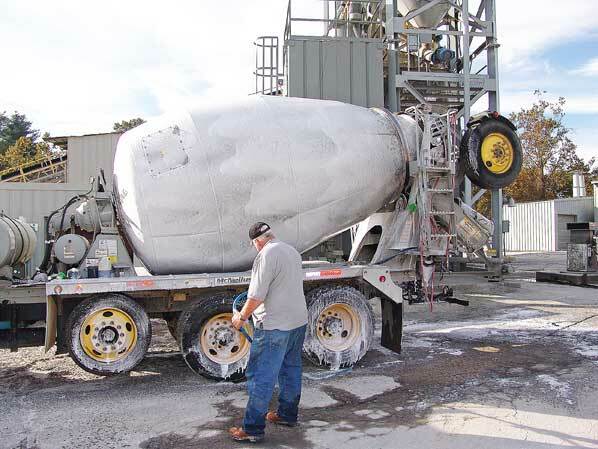 Concrete manufacturers and truck drivers look to Fortrans, Inc.® for high-performance concrete-removing products for their fleet of trucks, and there is no better product for cleaning cement residues from trucks than Mortarman CR-650™. Did you know that muriatic acid is actually just another term for hydrochloric acid? Many competing products proclaim to be free of hydrochloric acid, when all they’ve done is put muriatic acid on the label. Muriatic acid is bad for people, the environment, and your trucks. Heavy-duty concrete trucks require a heavy-duty concrete-removal product, and Mortarman CR-650 is the cleaner for the job. In addition to being biodegradable and able to breakdown to environmentally-safe carbon dioxide and water, CR-650 provides truck drivers and concrete manufacturers with a multitude of benefits. The best part? Mortarman CR-650 contains absolutely no hydrochloric or muriatic acid! This truck cleaner is a super concentrate: one 55-gallon drum will make 220 gallons of truck wash. This high level of product concentration saves money on shipping costs. CR-650 is also extremely versatile and can be used on other surfaces to remove concrete and cement. Spray, foam, or brush the truck cleaner onto the truck. Let the cement/concrete truck cleaner sit for five to ten minutes or until the concrete has softened. Clean and scrub with a brush. For maximum performance, apply cement-truck cleaner to dry buildup of concrete or cement. Our concrete removing products work much better when they are applied to a dry surface. Also, if your truck has a heavy concentration of dry concrete built up on the exterior, you may apply CR-650 and let the product sit overnight. Apply again and start with step one in the morning. For safety purposes, when you or your employees apply this concrete-removal product to a truck, they must wear safety glasses or goggles and rubber gloves. If skin contact happens to occur, rinse thoroughly with clean water. Should CR-650 get on clothing, remove the items and rinse them well before wearing them again. Order concrete removers from Fortrans, Inc. We ship to facilities in the United States and Canada.